Heavy Rain and Snow -- Happy Valentine's Day! Mother Nature sent Big Bear some much needed moisture this past week, but she was a bit aggressive in her delivery. 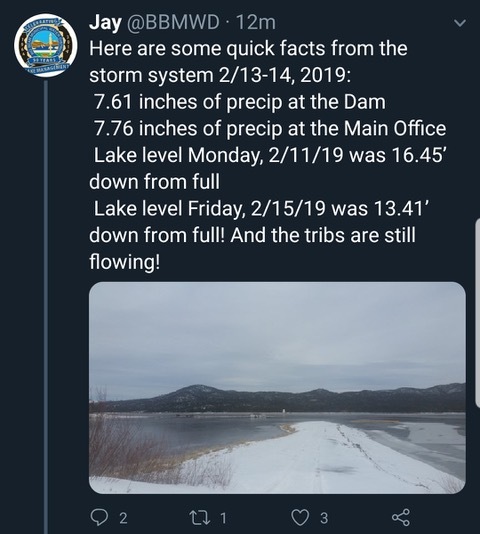 Warmer temperatures brought rain, rather than snow — almost 8 inches of rain on Wednesday and Thursday, as tweeted by Big Bear MWD today. Snow fell in the higher elevations, and more snow is expected over the holiday weekend as the temperatures turn much colder. The good news is the rising lake level — the lake rose 3 feet between Monday and Friday this week! It is still down 13.4 feet from full, but it is finally moving in the right direction. Surrounding tributaries continue to flow, and there is a lot of snow melt that will also flow into lake in the coming weeks as the weather warms. Thank you, Mother Nature, for this weather valentine. Keep up the good work! We hope that we will have a much fuller lake by summer.